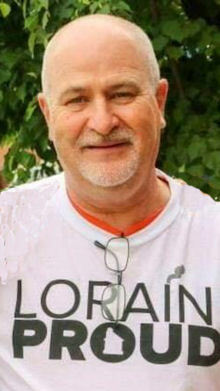 John D. Gargasz, age 59, affectionately known to all as Mr. Lorain, passed away unexpectedly on the morning of Sunday January 27th, 2019 while visiting his son in Orlando, Florida. Born in Lorain on October 27, 1959, he had been a life-long resident of Lorain. John was a 1977 graduate of Lorain Catholic High School and went on to serve his country as a member of the United States Air Force from 1979 through 1984. He fulfilled duty assignments with the 4950th Organizational Maintenance Squadron and was the recipient of the Air Force Training Ribbon, the Good Conduct Medal, and the Air Force Longevity Service Award Ribbon. For the past thirty years he had been employed by the United States Steel Corporation's Lorain-Cuyahoga Works as an electrician in the # 3 Seamless Mill. John was a member and current recording secretary of United Steelworker’s Local 1104 as well as the Union Safety Representative. In addition, he served as Vice President of the LCAFL-CIO. John spent his entire life as an advocate for the City of Lorain volunteering his time and service to better the community that he called home. He was also a staunch supporter of local Lorain businesses and a proud member of the Lorain Elks Lodge # 1301. When not involved in civic affairs, John enjoyed attending Jimmy Buffet concerts, traveling to Florida, and spending time with his family. He is survived by his wife Cynthia (nee Dawson), sons Nicolas Gargasz of Orlando, Florida, Joe Hummel of Olmsted Falls, and Brian Stoll of Lorain, daughters Kristina Barone of Sheffield Lake, and Nichole Barone of Cleveland, grandson Dexter, sisters Annette Bedell and Norma Jean Gargasz, along with brothers Edmund and James Gargasz and godchild Brennan Stang. John was preceded in death by his daughter Jennifer Lynn Gargasz in 2001, by his father Edmund Gargasz in 2004, and mother Anne Gargasz (nee Urban), in 1988.